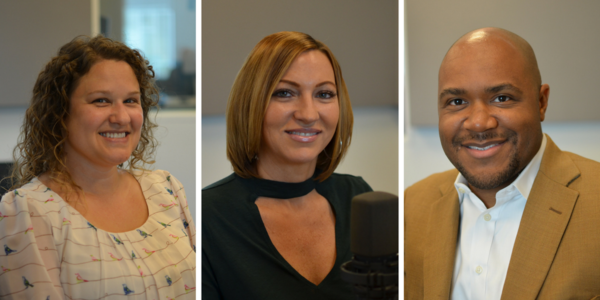 Heather Highland, Nicolle Barton and Aaron Banks, members of St. Louis' Civilian Oversight Board. Several have called for the strengthening of the COB in the wake of protests in response to the acquittal of Jason Stockley, particularly giving the group power to subpoena witnesses, which it currently cannot do. Joining us for the discussion about what it is that the COB does, were three of the group's members: Executive Director Nicolle Barton as well as board members Aaron Banks and Heather Highland. Members of the COB said they've had trouble clarifying with the St. Louis community about their role and also how citizens can file complaints. They offered up the resources on this website on where to call and visit as well as how to make a complaint. You can also call 314-657-1600 for more information. What does St. Louis' Civilian Oversight Board actually do? On St. Louis on the Air, host Don Marsh was joined by members of the organization to discuss what the group wants to change.